So, it’s September. That means Autumn, right?! Well… it’s still in the 80’s and 90’s here. The blazing sun fills our days. Putting on a sweater or scarf is the last thing I want to do. But maybe you are starting to see the leaves change and feel that little nip in the air as the sun begins to set? Whether you’re still waiting for Autumn or if it’s knocking at your door, this Autumn printable is just for you. Autumn is that great time of year when those cozy sweaters and boots and scarves get to come out of the closet. The trees look like they’ve been lit on fire, their blazing colors standing bold against the sky. Autumn brings some of the greatest holidays of the entire year. Some of the richest flavors and warmest foods spice up an Autumn day. That deserves to be celebrated. Welcome Autumn with this print on your mantle, piano, or other favorite place to decorate for the season. 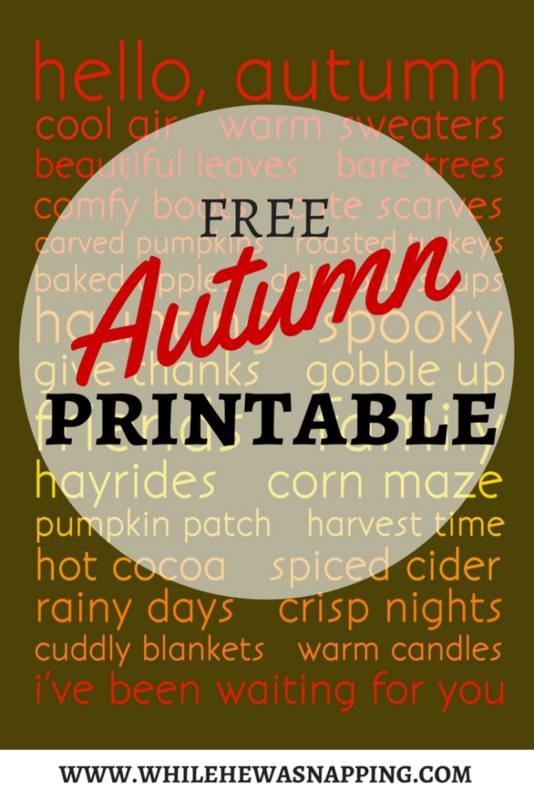 Celebrate your favorite things about Autumn with this seasonal art you can print and frame right at home. Or get creative and use it in your Fall craft projects. This print will last all the way through November! Get a full resolution, watermark-free version when you click on the image below or the following link: just download your copy of the Hello, Autumn printable and then print and frame. Or use it for your Autumn projects. You’ll need to “Save As” to your computer and then you can print from there. The file is formatted to 8″x10″. This image is protected by a Creative Commons Attribution-NonCommercial-NoDerivatives 4.0 International license. You may use this image for personal use only. Under this Creative Commons license you may download this work and share it with others as long as credit is given to Krista at While He Was Napping. No changes may be made to this image and it is for personal use only.